How do I migrate my settings from XChat? How do I autoconnect and join a channel on start? How do I auto-reconnect after my computer wakes up from being in sleep/hibernate mode? Why are channels joined before identifying? How do I change what browser is opened? How do I connect through a proxy? How do I show @ and + in front of nicknames that are Op and Voice when they talk? How do I set different ban types? Why does the timestamp overlap some nicknames? How do I hide join and part messages? Why doesn’t DCC send work behind a router? How do I execute multiple commands in one line? How do I play sound files on certain events? How do I minimize HexChat to the System Tray (Notification Area)? How do I start HexChat with…? Where are the log files saved to? Why do config files and logs appear as a single line? How do I rotate log files every so often? Where did the Real Name field go? Why don’t beep sound alerts work? How do I type Unicode characters? How do I add a network to the official list? In the Network List, select the network to which you would like to automatically connect to at startup, click the “Edit…” button, and then tick the checkbox for “Connect to this network automatically”. To automatically join channels for this network upon connecting, select the “Autojoin channels” tab in this same window and add your desired channels here. You can also add a currently joined channel by right-clicking its name in the channel switcher and by toggling “Autojoin” on. Use SASL which can be enabled in HexChat ‣ Network list ‣ Edit (2.9.4+). Note that your username must match your nickserv account, you can set it by unchecking Use global user information. Use a client cert which requires the most setup. Other DE’s have their own settings that may or may not work. Now upon launching it will use the Exec line in their desktop file replacing %u with the url. If you get a blank window this is where the problem is. Go to the menus, Settings ‣ Preferences ‣ Network Setup and fill in the requested information there. Authentication (using a username and password) is only supported for HTTP and Socks5. Don’t forget to press Enter, so the changes take effect in the list at the top of the window. Right click the nickname in the userlist, and choose a ban type from the “Kick/Ban” submenu. You can also do it manually: > /ban nick bantype where the bantype is a number from 0 to 3. Once you adjust this setting high enough, overlapping timestamps and nicknames should not occur. The adjustment will not take effect immediately, a restart may be needed. To disable joins and parts from being displayed in all channels check ‘Hide join and part messages’ under Settings -> Preferences -> Chatting -> General (Advanced pre-2.9.6)’. Then all channels you join after setting this will start with “Show join/part messages” turned off. If you are behind a IP-NAT or ADSL router, you will most likely have an address like 192.168.0.1. This address is not usable on the Internet, and must be translated. When offering a DCC file, HexChat will tell the receiver your address. If it says 192.168.0.1, the receiver will not be able to connect. One way to make it send your “real” address is to enable the “Get my IP from IRC Server” option in HexChat. This option is available in Settings ‣ Preferences ‣ Network setup. When you turn it ON, you will have to re-login to the server before it’ll take effect. This will allow you to send up to ten files at the same time, which should be plenty for most people. Lastly, configure your router/modem to forward ports 4990-5000 to your PC’s address. You’ll have to consult your router/modem’s manual on how to do this. If this is during connection the network list (Ctrl+s) has a ‘connect commands’ section as well as most login types you would need. /LOAD -e <textfile>, where <textfile> is a file in your config dir containing commands on each line. Separate your commands with CTRL-SHIFT-u-a. This will appear as a little box with numbers on it (or an invisible character). You can create two UserCommands, with the same name, and then execute the UserCommand. It will be executed in the same order as it’s written in the UserCommands GUI. If you get this error when trying to load a Perl or Python script, it means the plugin or language for running those scripts isn’t loaded. On Unix install the packages including these plugins (e.g. hexchat-perl) and perl. On Windows select the plugins in the installer. In the menus, go to: Settings ‣ Preferences ‣ Sound. Select the event you want to make a sound on, then type in a sound filename (or use the Browse button). On Windows, sound files must be in .wav format. On both Unix and Windows there is an included tray plugin. To enable minimizing to tray on exit go to Settings ‣ Preferences ‣ Alerts. HexChat supports many platforms and to be consistent it uses Unix line endings. This is normally not a problem at all but Microsoft Notepad does not support these so they are rendered as a single line. Any other editor should support them. By default settings, no rotation occurs, your log files will just keep getting larger. %Y, %m and %d represents the current year, month and day respectively. %n is the network name, e.g. “FreeNode” or “UnderNet”, and finally, %c is the channel. In these examples, a new log filename and folder would be created after midnight. The format can also be a full path if you want to save logs to an external drive for example. For the full list of formatting codes, please refer to the Unix or Windows documentation on strftime . 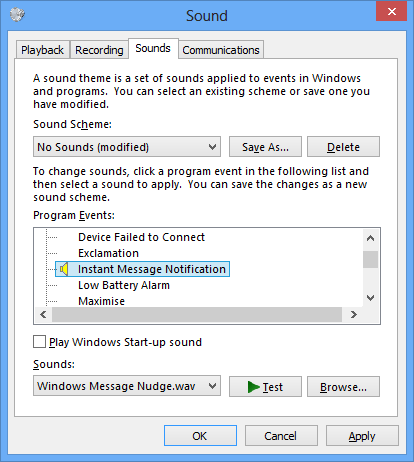 On Windows, HexChat is using the Instant Message Notification system sound for making beep alerts, and if it’s unspecified, it attempts to produce a simple beep effect. In case you don’t hear beeps when alerts occur, you need to set this system sound to the desired sound effect. To do this, go to Control Panel ‣ Hardware and Sound ‣ Change system sounds. On Unix it uses libcanberra by default to play the “message-new-instant” freedesktop sound. Use the canberra-gtk-play command to test playing events or custom sound files as that is likely where the problem lies. Press Ctrl + Shift + U at once. When you release the keys, u will appear in your input box. Now you can enter the 4-digit code of the desired glyph. When you’re done, just press Space or Return , and the glyph will appear as well. Windows alt codes will not work. There are no official requirements to be added to the network list, but there are some simple guidelines of what the network SHOULD have. A maintained website listing servers. A decent amount of active users (100+). Doesn’t block large groups of users. You should make a pull request on GitHub if you want the quickest results, the list is stored in src/common/servlist.c. You should include an SSL server if supported but you should not include IPv6 only servers and mark SASL as default if supported. Follow the syntax of other networks in the file.